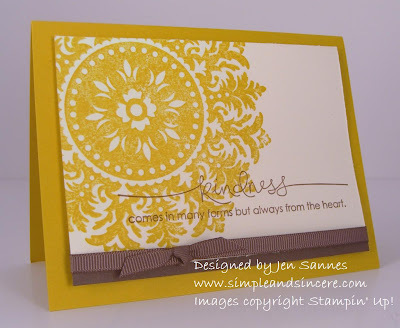 This is another card from last week's Clean & Simple stamp-a-stack. I was inspired by this card I saw by Tara Fullmer on Splitcoast - I added the sentiment and ribbon, but kept the same colors and layout. I love the warm look of Crushed Curry and Chocolate Chip - yummy! We are heading out EARLY tomorrow morning for our trip to northern Minnesota. We're going to attempt to leave our house around 4am... We've never done this before, but we're hoping the kids will sleep for a little while in the car. I have a feeling that this plans sounds really good in theory, but may not work out *quite* as planned. I'll let you know... Anyway, I am looking forward to spending a week at the lake! I'm packing several books, my latest Real Simple magazine (just came in the mail today - wahoo!) and my SU! cattie. :) Oh, and of course all of the other lake essentials - swimsuit, Crocs and comfy clothes. Don't worry, though - I have a guest designer lined up for you for next week, so be on the look out for some terrific cards! Have a fantastic weekend! I absolutely love this card - colors, stamps, composition! I love this card too... so much so that I've had it in my Inspiration folder for months now. I finally CASE'd it this weekend!